Jared Leto was so disappointed in Suicide Squad and his squandered screen time that it looked unlikely that he'd be back for Suicide Squad 2. That movie was just put on the back burner in favor of Gotham City Sirens, which teams Margot Robbie's Harley Quinn with other iconic DC villains such as Catwoman and Poison Ivy. Now the question becomes, will Jared Leto return for this female-only endeavor that pretty much guarantees he'll once again be relegated to nothing more than an extended cameo? Perhaps there will be something more for Jared Leto to do in Gotham City Sirens, but it doesn't sound like it. Once called Harley Quinn and the Birds of Prey, Gotham City Sirens has been in pre-production for the better part of this year, and is further along in the process than Suicide Squad 2 and the proposed Deadshot spin-off that stars Will Smith. But both of those movies are continuing to move forward as well. David Ayer, who directed Suicide Squad, is coming back to helm Gotham City Sirens. The movie is based on the Paul Dini comic book, which finds Harley Quinn teaming up with Catwoman and Poison Ivy to claw their way to the top of the Gotham City villain food chain. As Nerdist points out, it is unclear if any male DC characters will get substantial screen time. But it seems likely that at least Batman will make a courtesy appearance, even if Ben Affleck is busy with The Batman, which was seemingly confirmed for a 2018 release date yesterday. While The Joker's fate remained uncertain for a big portion of Suicide Squad, he does return at the end to sweep his true love Harley off her feet and rescue her from Belle Reve. At the moment, it's hard to imagine how Harley and Joker's relationship can fit within the construct of the female friendship that plays out between Quinn and her new villain gal pals. More importantly, it doesn't sound at all like Jared Leto is ready to go method again for just a few seconds of screen time, though he did climb back into the purple suit and clown make-up for a three minute appearance in one of the music videos timed to the release of Suicide Squad in theaters. As Suicide Squad made clear, Joker isn't necessarily needed in a DC villains movie. And his appearance this summer seemed shoehorned in. Harley Quinn is her own character at this point, and she doesn't need to play second fiddle to The Joker, especially when she is supposed to be rising through the ranks on her own. But even if The Joker is brought in, DC Films and Warner Bros. might have to find a new guy to play him. Just a few weeks after release, showing up at one of his 30 Seconds to Mars gigs, Jared Leto expressed his disappointment in Suicide Squad, and the fact that he wound up on the cutting room floor. At the time, it sounded like he was done with the world of superheroes. DC specifically. One 30 Seconds to Mars fan said this about Jared Leto's attitude in regards to the finished product. "He was very honest about the film this weekend; his disappointment in what he's learned of the theatrical cut (he's still not seen the film); feeling sort of tricked into being a part of something that had been pitched to him very differently; thinking it would've been more artistic than what it became; feeling overwhelmed by the hate regarding the look and choices..."
It is very likely that Jared Leto signed a multi-picture deal to appear in other DC movies as The Joker. He did reportedly reveal that his contract has stipulations saying that he can't participate in dangerous activities. Given that Leto loves to go rock climbing, he didn't take to that very kindly. A fan posted a video clip of the actor responding to this bit of his contract, in which he simply says "f*ck em!" 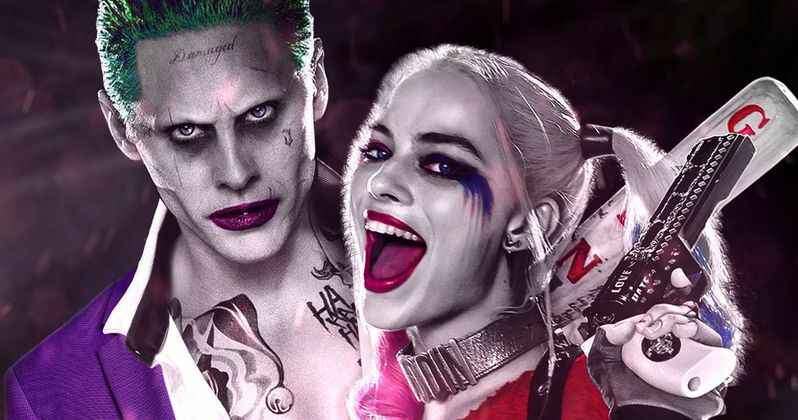 It was previously reported that DC Films and Warner Bros. are considering a Joker spin-off to go with the Deadshot spin-off and Gotham City Sirens. But so far, Gotham City Sirens is the only DCEU spin-off that is officially a go at this time. Megan Fox is reportedly wanted as Poison Ivy. We assume that news will die down over the holiday break, but we'll definitely be hearing more about Harley Quinn's next film sometime early in the new year.